A small little girl from Brunswick, Maine by the name of Aly Spaltro had the dream and the desire to get her sound out to the world. In a surprisingly short period of time, she’s accomplished a rather incredible amount of hype, a number of EP’s, mixtapes, music videos, a newly released full-length studio album, and a now growing group of invested fans that hang off her every word. Not bad for a 23 year old in the world of indie rock (hers is more eerie at times and always more interesting than most, so it may not actually be that surprising to anyone, really). I thought, as I was new to her sound and her music that I’d start at the beginning. And that’s just what I did. Back in Brunswick, Maine, your hometown, did you have musical chops as a child or was it more of a performance deal for young Lady Lamb? 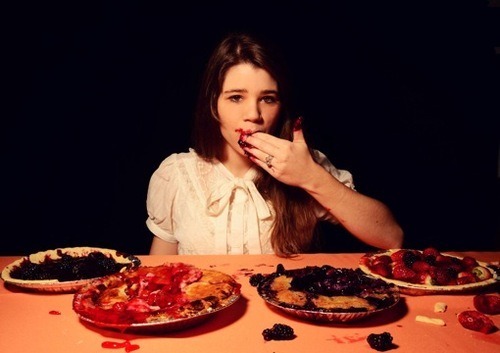 Lady Lamb: I had musical leanings but never any desire to perform. It was basically just an obsession with music from an early age. Between the two of them, my parents listened to a very eclectic mix; my mother loved the 80’s or classical music pretty much exclusively and then my dad listened classic rock, Stevie Ray Vaughan, and all those guitar heroes. … Oh! And then when I was five I lived in Arizona. My next door neighbour was my babysitter: she was 13 and kind of a weird kid and really into the Beatles, late Beatles, you know? Absolutely. White Album and all that. We hung out a lot and became good friends, which made me a very strange five year-old! So we would just sit around and listen to The White Album and Rubber Soul all the time and through that I started listening to “oldies radio” on my own. I started making mix-tapes cause I was really into The Supremes, Mamas and The Papas, Leslie Gore, Otis Redding… basically everything on oldies radio stations. So it was just an obsession at that point? For sure. I didn’t have any desire to really play it, I didn’t think of it that way. I was a shy kid to begin with so I never wanted to perform or be in talent shows or sing or take lessons or anything like that. And your first recordings, kind of show that shyness. You recorded it all yourself, packaged them all yourself, brought them to your local record store; you did everything on your own. Was that more of an experiment or did it just get to a point where you needed to start sharing what you were creating? It was both but it really started as a way for me to express myself in a way that was really focused and dedicated. I wrote a lot of poetry in high school and I wanted to do something, honestly, with my year, because I took a gap year between highschool and college, and I wanted to do something that was really involved before college. I taught myself how to play and started singing at that point and for the first few months I had no desire to share any of it. But then, after packaging it up and giving a bit away for free I really just sort of fell into [the industry] by accident. I started performing and really getting something out of that which I don’t think I expected. Did you feel you really had any specific pushes to get more into the spotlight and stray from that shy girl you were as a kid? I never felt any “pressure” from anyone I knew really. I worked at an independent DVD rental store for four years and they became my second family. My boss at that store was a huge film and music buff and after hearing my stuff he was the first to really encourage me to play a show. And then my dad told me to try but it was really up to me and it took me a long time to get up the courage to get on stage. Typing your name into any search engine, a whole lot of videos come up and many from early on in your career. For someone self-admittedly shy, do you feel there’s something visually you need to present with your music as well as lyrically? It has to do with a number of things. I know that “I” as a music fan want to see artist’s visuals. If I’m checking out a band for the first time I will most likely look up a music video. And it comes from that; it comes from being a fan and thinking that video is an integral part to the art. Also, as a kid I loved to draw, paint, collage, make movies, and all that so naturally the visual came ingrained, for me, in the music. It makes me feel really lucky that I’m doing something that I love that has room for other mediums as well. In just about all of your videos, although serious at times depending on the subject of the lyrics, there seems to be an undercurrent of light heartedness. Is that and uncontrollable element of your personality just breaking through or is that something planned that you want in your music and your creative process? Well, in the case of the videos, it’s probably just me coming through. I have this one video where it’s a one-take, pretty serious video called “Between Two Trees” where I’m just standing in front of a wall… I’m singing along (so that it doesn’t just look like I’m lip-synching), I’m singing in the room but then I mess up the lyrics. I got all flustered, laughed, but then kept singing. That happened, so why do the take again, you know? Just let it be, because I’m a little silly so just keep that in there. Your album Mammoth Swoon, a 2010 release, received some well-deserved attention for being a pieced together album of demos and b-sides. Did that come together naturally for you? That I put out myself and is just a mix of stuff. It wasn’t really meant to be released it was honestly meant as something I wanted to leave with Portland, Maine when I left for New York. But then when I moved I needed something to give to people so I kind of just kept making it and so any press it got wasn’t intentional. I mean I didn’t even have a publicist until this newest record. Working so much on your own, do you find that knowing more about the business side of the industry; booking shows, handling publicity, etc. is something you’re pleased about or are you just happy to leave that up to others now? I’m super pleased I learned that way! I don’t know if other artists really talk about this but for me, I’m first in line to hear about anything and everything that comes through about my music cause that’s the way I like it. I like answering e-mails and talking directly with promoters and publicists because that’s just part of my personality! I wouldn’t have it any other way, really. Your newest and first studio album Ripely Pine (released May 2013) having dropped now, do you have expectations for the work? I made sure to not have any expectations what-so-ever. I’ve learned in my life that it’s a pretty good rule to not have any expectations on anything you do, or people for that matter. You make these high expectations and then you’re disappointed. So I decided that if I went into the studio with that [expectation filled] attitude that I would end up making something that wasn’t entirely honest because I’d likely be too focused on what other people thought. Pleasing others, hoping to get good reviews, stuff like that I tried not to think about at all. In that way, I’ve made something that I’m ultra proud of and I worked for more than a year on this because, well, I had the luxury to work with my producer for that long, but also because I didn’t want to cap it until it was fully finished. I needed to work on it until I knew that I wouldn’t have a single regret about the way it was made and that’s what happened. This sounds so… I don’t know… but the feeling of finishing it and the fact that it took so long, so much hard work, sweat and tears and all that, and just the joy that it’s done and it’s real and it’s out and now the rest doesn’t matter, really. So to really answer your question, because I had no expectations I’m pleasantly, pleasantly surprised and I’m very happy that people seem to really like it and are responding to it. Touring for this release seems pretty hectic by the looks of your schedule. You mentioned earlier that you’ve got a three week break coming up; do you feel that needs to be a “re-charge and relax” break or can you just not shut the creativity faucet off? I haven’t written a song in a long time because I’ve just been in a different space: “Work this record. Tour. Go. Go. Go!” you know? So I’ve been feeling the urge to write again. I was on tour in Europe before this and the urge started there and when that happens generally the lyrics come first for me. I can’t just grab a guitar and go, I write a lot of poetry and then when I get home I put music to it. I’ve written a lot of lyrics in the last month that I’m really excited to use the three weeks coming up to get home and put music to. I’m also gonna eat a tonne of Brooklyn food. That’s number one [laughs]. On your website you have a section called “In The Books” where you can scroll through random pages of some of your notebooks. Is that just a fun outlet for you in posting that? I can’t remember how that came about but I just thought that might be a really intimate thing that people might appreciate. As a music fan I know I thought to myself, “Wouldn’t it be cool to see a musicians notebook or scribbles on song or the original lyrics to a song by the Beatles or something like that?” That’s so amazing to look at! There’s a lot of personality in the way a person writes and what they’re saying when they’re just writing in a notebook and not thinking about two years down the road when it gets posted on the internet or whatever. What I really like about it is that there are the “beginnings” to a lot of songs in there randomly. The beginnings of ideas from years ago are in there that ended up in this record and that’s pretty neat. In terms of future dates, you’ve got Hopscotch Festival in Raleigh, NC as your last posted date this year. Another break then or is that just as far into the future as the site has been updated? That’s in early September, ya. I would like to have the month of September mostly off because I’m planning a tonne of stuff after that. It’s not up yet but I’ll be touring again in October, November, December at least! Touring for this new album seems to be taking up all your time but is there something upcoming that you’re really excited about in terms of releasing a single, a new video, some more b-sides possibly? … Just let the creative muse fly, right? Pay attention, oh muses. This New Yorker may put you out of the business Lady Lamb The Beekeeper’s music continues to be creative, full of personality, charm, and, seemingly, there’s no end in sight. Ripely Pine is available on iTunes and more than likely multiple physical copies can be found at that little record store in Portland, Maine along with a throng of happy fans!